Looking for a quick and easy treat? Tired of feeling guilty for eating more than one cookie? 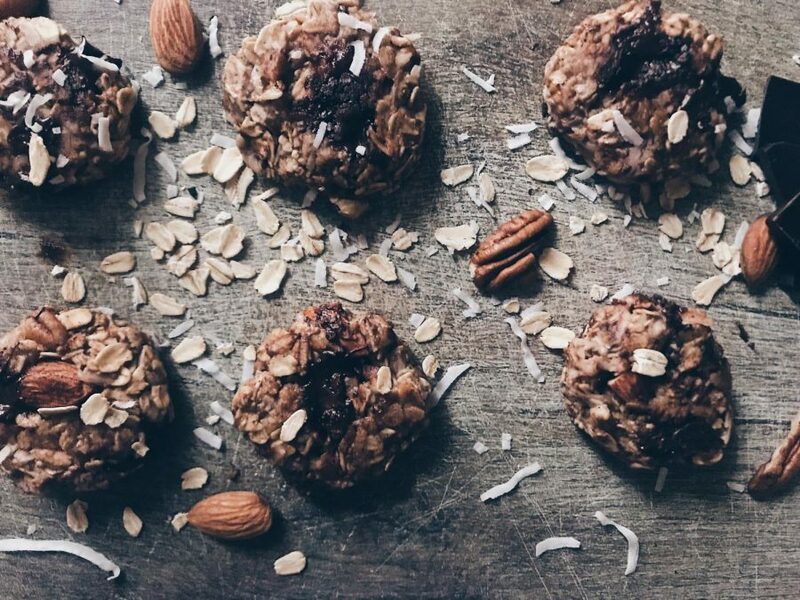 Made with wholesome ingredients, these chunky monkey cookies are healthy enough to eat as a snack, late night dessert, or a quick on the go breakfast. Not only are they vegan, gluten-free, dairy-free, egg-free and contain no added sugars, but are to die for! Although the recipe calls for various ingredients, you can add or subtract to it. Not a fan of pecans? No worries, add raisins or chopped walnuts instead. You can change the almond butter for peanut butter or maple syrup. The Chunky Monkey recipe is just a quick guide, so don’t forget to make the recipe your own and enjoy every bite of it. If you choose to go a little healthier, you can leave out the chocolate chips. They won’t be chocolatey anymore, but the other ingredients will still make the cookies tasty and sweet. Since they consist of no flour and minimal ingredients don’t expect a crunch, for they’re quite chewy and have more of a muffin-like texture. Who said, vegan cookies aren’t satisfying? They make an awesome snack and before you know it, they’ll be the satisfaction for your sweet cravings. All you really need to make these cookies is 3 ingredients. They include oats, banana and almond/ peanut butter. The rest are just extra ingredients that’ll make the cookies extra yummy. They are super easy and fun to make. The taste and texture is something different, but that doesn’t make them less awesome. They’re vegan, gluten-free, dairy-free, egg-free, sugar-free and are less calories than the typical chocolate chip cookie. You can add less ingredients to reduce the calorie and fat intake. Other than that, the chunky monkey cookies are a guilty-free pleasure. Measure and prepare all of the ingredients. Mash the bananas in a bowl with a potato smasher or fork until it takes the form of a paste. Slowly mix in with the coconut milk, vanilla extract, coconut oil, and cinnamon. Add the 2 cups of quick oats. Once the ingredients are well mixed, add in the dark chocolate chips, chopped pecans/almonds, chia seeds, and unsweetened coconut flakes. Drop 16 spoonfuls of the mixture onto a cookie sheet and shape them into cookies. Bake the cookies for approximately 15-20 min. They should be slightly browned and firm.